FRP Bypass APK or FRP Bypass Tool � It is used to Bypass Google Factory Reset Protection in case you forget your Google Password after Factory Reset. You can use the FRP Bypass Method to save yourself from all the trouble.... Download FRP Tools Free. If you want to bypass FRP lock on your Android devices. You'll be needing a different type of FRP Tools. Here we have all the Bypass FRP Applications. Moreover, if you want to Bypass FRP on Samsung devices you can use our guide. A classic FRP Bypass tool that can also be in use to override and remove phone locks. This software is compatible with the majority of Android devices like Xiaomi, Samsung , HTC, Huawei. Another significant advantage of this software is it is free to download and use.... FRP Bypass APK or FRP Bypass Tool � It is used to Bypass Google Factory Reset Coverage for individuals who put out of your mind your Google Password after Factory Reset. You are able to use the FRP Bypass Strategy to save yourself from all the bother. If you want to use the app which you don't use frequently, maybe you have no shortcuts for it. So, you may have to search the app from a list of many apps. Even if �... FRP Bypass APK or FRP Bypass Tool � It is used to Bypass Google Factory Reset Protection in case you forget your Google Password after Factory Reset. You can use the FRP Bypass Method to save yourself from all the trouble. Bypass FRP Samsung Galaxy ON5 PRO. If your Samsung smartphone released in 2016, and run on Android 5.1 or higher your device will support FRP or Factory reset protection.... 2. SideSync This is a freeware FRP bypass tool which also acts as a data sharing application between your PC and phone. It works with Quick Shortcut Maker to download the compatible APK file. How to Bypass FRP Using The Quick Shortcut Maker? Tap on �Type email and password� Quick Shortcut maker option. Next, click on try option and it will ask you to type your Google account password. Tap on three dots showing on the top right side and select browser sign in option. Step 7: first install google account manager Ensure that unknown sources are enabled. after that install �Quick Shortcut Maker�, at last tap on �OPEN� from quick shortcut maker to open it. Step 8: Click on the search bar Now open search Google account manager on the list. Quick Shortcut Maker Android APK. 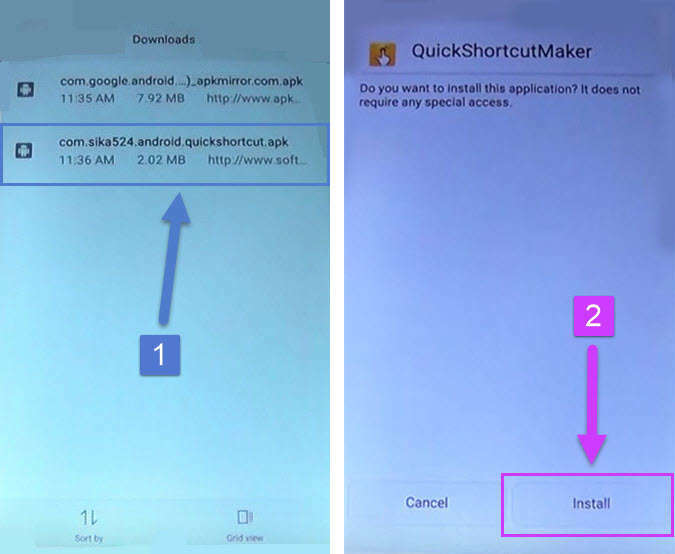 Android App, Quick Shortcut Maker Android APK For FRP unlock, quickshortcutmaker v2.4 apk, fast easy route creator apk downloader, quickshortcutmaker sidestep, snappy alternate way creator frp open, Quick Shortcut Maker Android APK download.